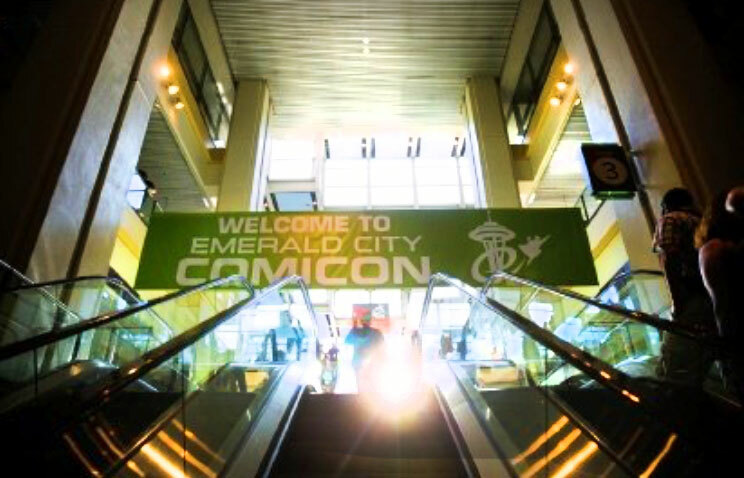 Welcome to my ECCC Wrap-Up for Emerald City Comicon 2016. 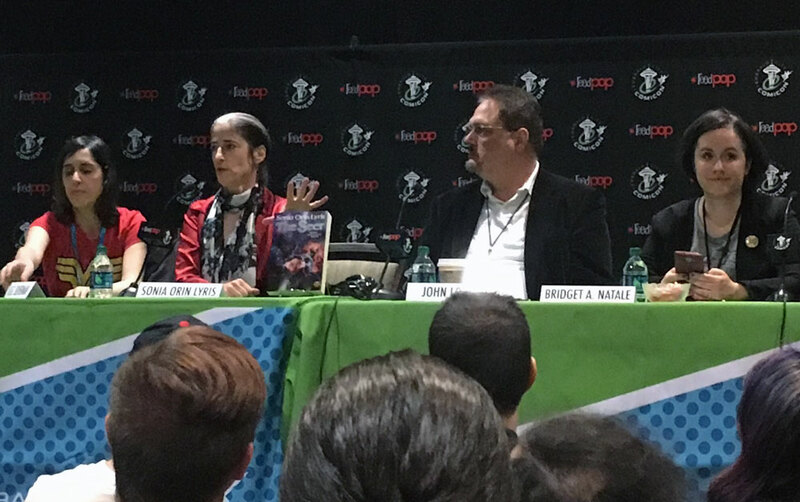 2016 was my fourth Emerald City Comicon, but my first as a professional author and panelist. 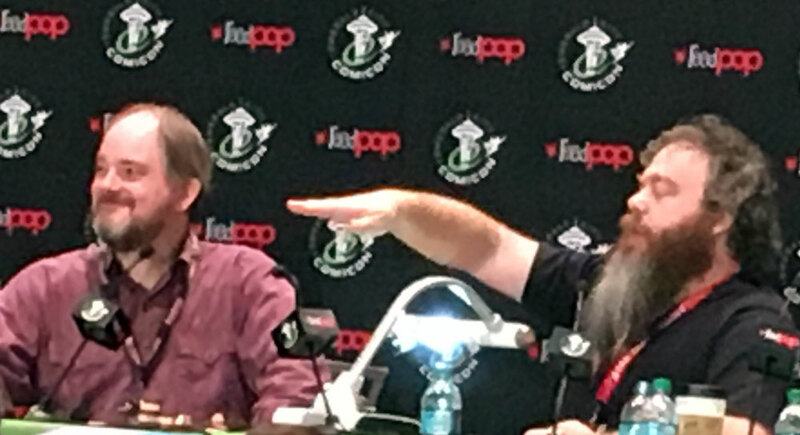 Unlike fan-run conventions like Norwescon or Anglicon, ECCC is run by ReedPop. It’s owned by a company that owns most of the Comicons in the U.S. and is much, much larger than most fan-run cons I frequent. 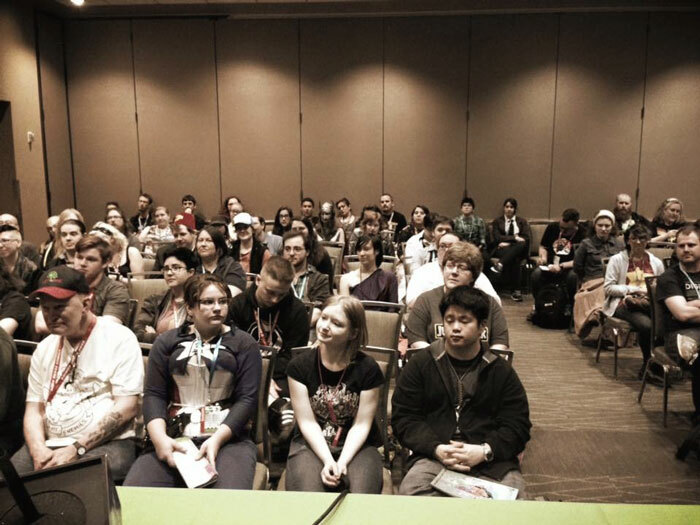 As such, ECCC is a great opportunity to speak to a much larger fan-base and audience. The down side to this is that ReedPop tends to treat folks like a number. When you’re dealing with 100,000 people, it’s hard to maintain a sense of community or care. In past years, there was seating set aside for those in wheelchairs as well as all disabled (visible or not) and their plus ones. This year, this seating was not available at all. Many folks I know who are wheelchair bound were seated in the rear of a room where they couldn’t see the panelists or stages. Some were completely turned away as no seating was available. 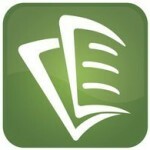 Comicon added a fourth day (Thursday) to their convention, but didn’t add enough content to warrant the extra day. 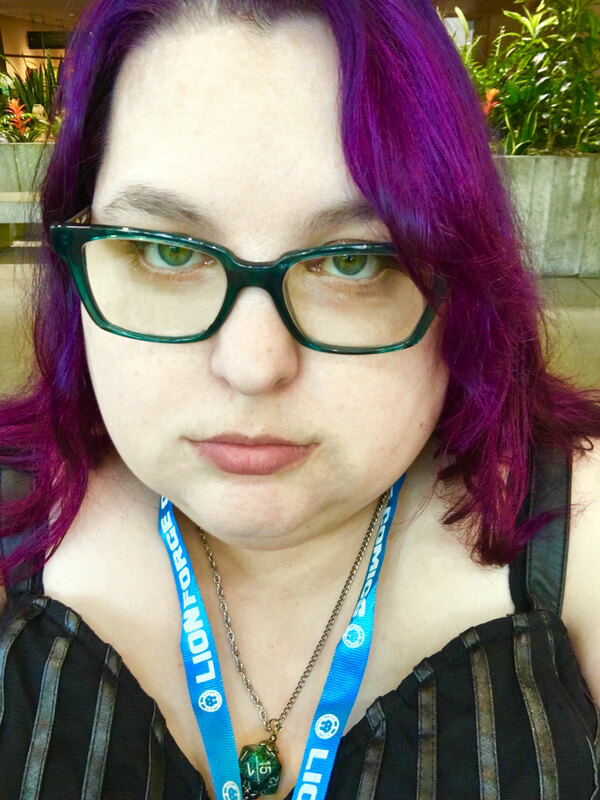 While my pass was free (speaker), many paid for Thursday passes only to find that the dealer’s room didn’t open until 2 PM (and closed at 7 PM), there were very few panels that day, and there was no gaming at all on Thursday. In short, people were bored. Rather than opening scheduled gaming at 10 AM (the same time as the dealer’s room opens) on Fri/Sat/Sun, scheduled and open gaming didn’t begin until noon. Because most of the larger panels and events were in the 2 PM-6 PM slots, this left very little time to participate in tournaments, scheduled gaming, or even open gaming because folks were elsewhere. I came expecting to game from 10 AM – 2 PM, which wasn’t possible with this new schedule. 🙁 In short, I did very little gaming. 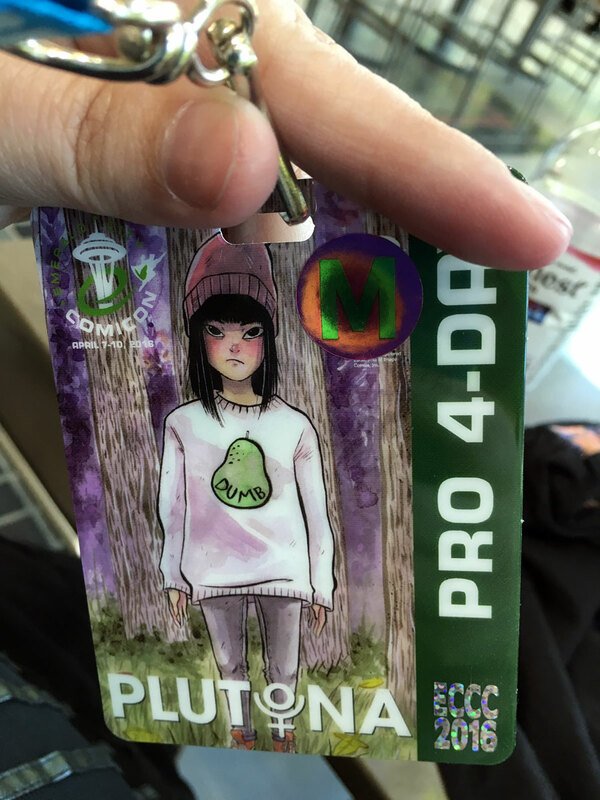 Wizards of the Coast was very absent from this ECCC, which is like butter missing from toast. 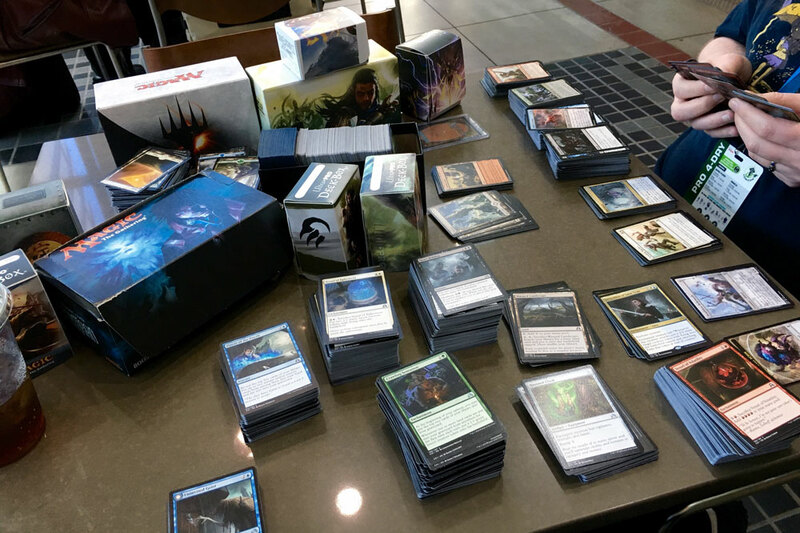 This was a release weekend for Magic: the Gathering. In previous years, WOTC was present at both PAX and ECCC to have release weekend draft tournaments and events like scavenger hunts and team battles. Not only was WOTC missing, there were none of the expected release weekend events at all. For me, the dealer’s room was a mass of too many bodies and too many booths in such a small space. Artists’ Alley being split in half made about as much sense as their website. My husband and I bought a box of the new set (Shadows over Innistrad) and did our own draft, which while fun, isn’t nearly has fun as playing with others. We could have gone to Cafe Mox / Mox Boarding House for that. So what did go right? 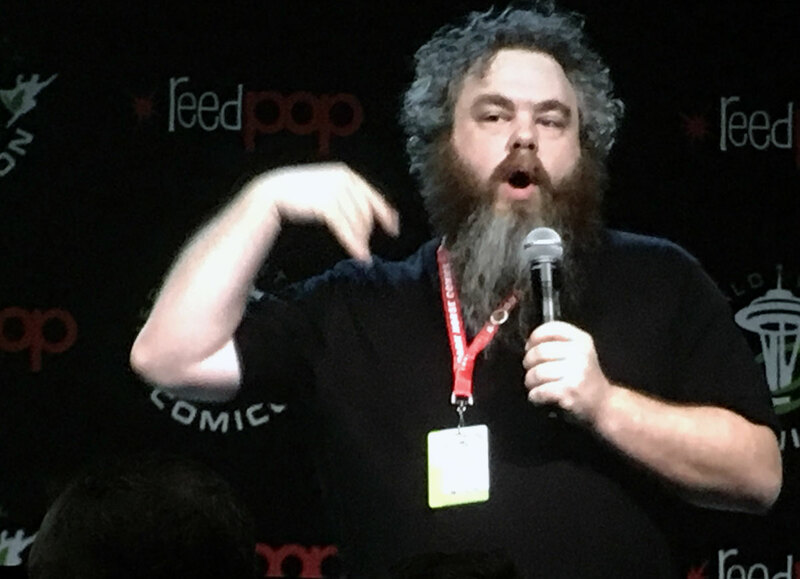 We got to see Patrick Rothfuss do a reading (which is always fun), and we watched him demo a new tabletop game based on his books called Tak. Tak is going to be amazing once its out (the Kickstarter begins on 4/19/16!). Saturday night, we attended an amazing charity event for Worldbuilders. We and roughly 150 others played tabletop games from 7 PM until 11:30 PM with folks like Patrick Rothfuss, Angela Webber (of The Doubleclicks), Ben Cammarano (senior creative director on Halo), Cat Rambo (author/editor and SFWA president), Chris Perkins (story designer for D&D), Doug Beyer (story designer for Magic: the Gathering), Jason Bulmahn (designer for Pathfinder), Marian Call (musician), Molly Lewis (musician), Peter Orullian (author), Robin Hobb (author), Trin Garritano (producer for Cards Against Humanity), and many others. We ended up playing Secret Hitler with Trin Garritano and Pathfinder with Jason Bulmahn. (We got to suggest what we wanted to play, but in the end, the event runners randomly picked most of the gaming tables.) There was a silent auction and a raffle in which we won a Magic the Gathering Duel deck from the new set (Shadows over Innistrad). Our friend, Elise, won a gold one ring from Lord of the Rings. It was a great night for charity that raised over $6,000 for Worldbuilders and Heifer International. The other thing that went right was our panel. I’d worried about whether people would show up because our panel was smack against Patrick Rothfuss‘s panel on writing. The picture above shows about half the room and was taken before we started. Five minutes into the panel, there were only two seats remaining and the ECCC minion at the door was having to count in case he needed to turn folks away. Our panel was called “I Need a Hero” because we do. We all need heroes. We wish we could be the hero of our story (our life), but when dealing with disabilities and diseases, it’s not always easy to be the hero. 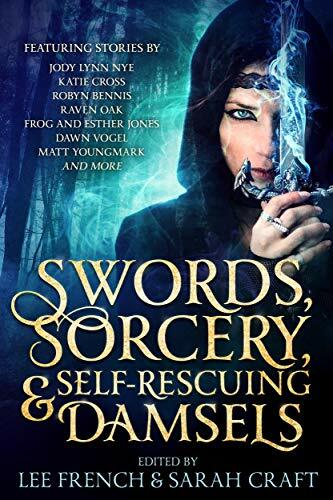 It’s even less easy to find a hero like us in the books that we read, the movies we watch, etc. As moderator, I had a whole slew of questions to guide the panel as needed. We barely covered three as my co-panelists and the audience members were so eager to talk about PTSD, mental illness, additction, chronic pain, and everything else that is lacking in media stories. We ran straight to the end time and afterwards, many audience members came up to chat with us as we were leaving. I got to meet so many people–one of which is a real-life super-hero! SkyMan, the Tri-colored Crusader, from Federal Way, WA, hopes to encourage others to be the heroes of their story, which is an idea I can get behind! Even if I’m not pleased with the changes ReedPop is making, I’m proud of the panelists’ thoughts and ideas and the audience’s inquisitive and thoughtful questions. 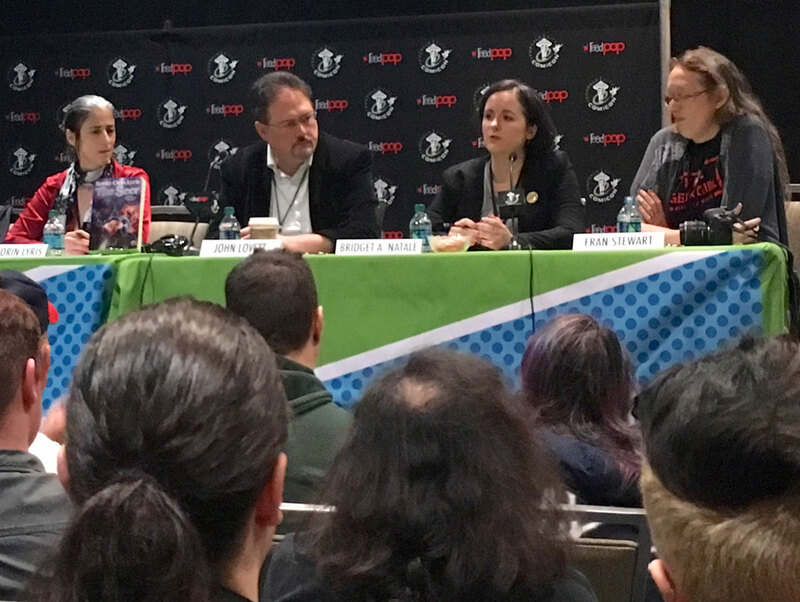 It was the perfect panel and the only thing that could’ve made it more perfect would have been a longer time slot (which doesn’t happen at ECCC).